The BIC® iconic 4 Colours™ ball pen is a highly recognizable pen with its unique design and original multicolour feature. 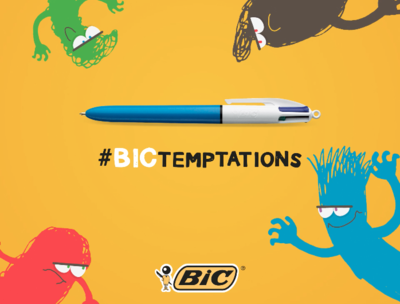 The objective of the campaign is to remind young people just on how desirable and irresistible the BIC® 4 Colours™ ball pen is. It relies on a strong insight amongst students who very often have their favourite pen disappearing from their pencil cases! Both the campaign idea and social videos come from eYeka’s creative community, specialised in crowdsourcing content to bring even more brand creativity than classic advertising campaigns. BIC chose to launch a video contest, and eYeka’s community submitted many hilarious and creative videos, among which 7 were chosen to be featured in the campaign. BIC is back on the web from August 29th to the October 10th to digitally support the Back to School period and continue driving, as the leader in Europe, the Stationery growth. “It is the first time BIC crowdsources content. This was a unique opportunity for us to explore creative ideas from really talented people who were able to share with us their vision of the BIC® 4 Colours™ ball pen and #BICTemptations”, Bénédicte Muller – Marketing Manager Europe Stationery – says. The campaign will roll out in Italy, Spain, UK and Germany, both on the My Bic Pen Facebook page and the Bic Group YouTube channel.